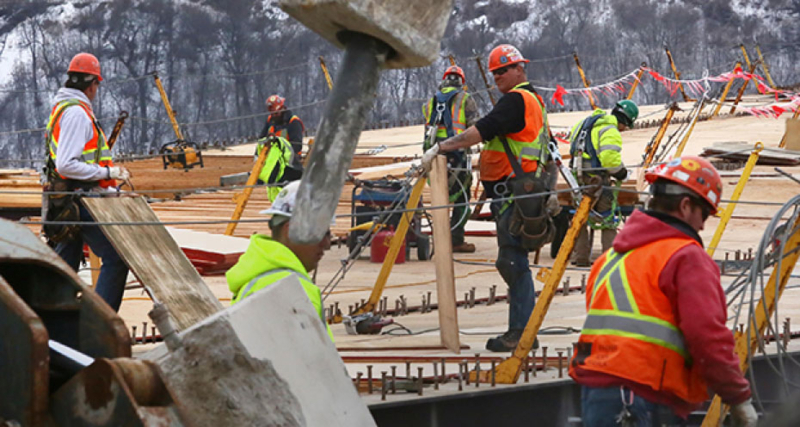 Minnesota’s construction industry gained 4,867 jobs in February, a 4.8 percent increase from the previous February, according to state data released Thursday. In the same month, the unemployment rate among black residents declined to 6.9 percent last month from a historic low of 7.4 percent in January, according to unofficial estimates from the Minnesota Department of Employment and Economic Development. Still, it’s more than double the 2.8 percent unemployment rate for white workers. Minnesota’s overall unemployment rate dipped by 0.1 of a percentage point to 3.2 percent even as employers shed 1,300 jobs in February. That loss was offset by recently revised DEED data from January that showed a gain of 4,900 jobs that month. DEED previously said 2,500 jobs were added in January. The U.S. unemployment rate was 4.1 percent in February, unchanged from January. Construction was the fastest growing employment sector in the state in February. The national growth rate for the sector was 5 percent. In all, 105,694 people worked in the industry in February in Minnesota. Other demographics in the Minnesota labor pool – including people who did not graduate from high school and teens – also saw gains in February, said Steve Hine, director of DEED’s Labor Market Information Office. “Employers are having to turn over a lot of rocks to find people to fill positions,” Hine said in an interview. Peak construction employment for the month of February came in 2006, when there were 132,000 construction jobs, Finance & Commerce reported previously. Minnesota’s highest number of construction jobs was 146,100, in August 2005. The industry shed thousands of jobs during the Great Recession. The lowest point was 73,332 jobs in 2010. Builders are having trouble finding enough workers, said Don Kohlenberger, president of Minnetonka-based Hightower Initiatives, a construction consultancy. Unions and trade groups are trying to cultivate more talent among high school students and recent high school graduates, he said. But there still are not enough workers in the pipeline, which has some companies hiring talent away from others. Within the construction sector, the biggest year-over-year job gains came among specialty trade contractors (up 6.9 percent) and in heavy and civil engineering construction (up 6 percent), according to DEED. The biggest decline was in the category of “foundation, structure, and building exterior contractors” (down 2.8 percent). The picture for Minnesota’s jobs and economy looks promising, though Hine noted “there are some signs of a little bit of anxiety” around President Donald Trump’s proposed trade tariffs. Education and health services led all sectors in February with 8,451 new jobs, an increase of 1.6 percent, DEED said. Other gainers were government (7,360); trade, transportation and utilities (3,627); leisure and hospitality (1,193); manufacturing (139), and other services (63). The biggest job losses for the month came in the financial services sector (down 1,365) and the information sector (1,316). Both have some influence on the success of the commercial office market, Hine said, but DEED does not track how many of these jobs are office-based. Other sectors shedding jobs in February were professional services (338) and logging and mining (52).